Check out http://www.velocipedesalon.com/forum/f22/llewellyn-bikes-18350.html#post247368 at the Velocipede Salon. 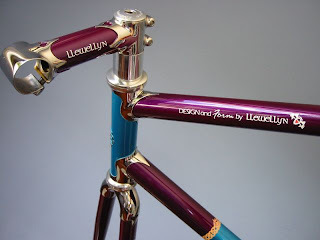 Darell is an amazing bicycle builder and has in interesting bicycling history. Check him out, ask questions and check the other builders who have been Smoked Out!!! The beautiful lug work below is an example of what he is capable of. Below are a few shots from the shop this weekend. This will be my new road bike, mix of columbus and dedaccai tubing. The finish turned out amazing, but the build had some difficulties. I dd not pay attention to the set up of my chain stay/seat stay mitering fixture. The stays are visibly shifted to one side - very frustrating!!! I should have known better to work late and push the process - am just not that good yet. This is a detail shot of the chain stay bridge before filing). This shot is before going back in and adding more silver the filet. This is my first try at adding Front Derailleur braze on. This one went smoothly, but I should build a little fixture for this. I just used an old file with a bent tang to hold the braze on in place. It works, but the part could move if not carefully set up. This is a teaser shot of my finish paint. It turned out nicely. I will get a better shot when the photo booth is set up.